At R&R Trade International, Inc, (operating under the trade name ORINOCO COFFEE & TEA, LTD,), we value our customer’s trust. The information gathered within this website will not be shared with or sold to others. Cookies are unique identifiers that we transfer to your device to enable our systems to recognize your device and to provide features like recommended for you and storage of items in your Shopping Cart between visits. Like many other Web sites, this site also makes use of log files. The information inside the log files may include internet protocol ( IP) addresses, type of browser, Internet Service Provider ( ISP ), date/time stamp, referring/exit pages, and number of clicks to analyze trends, administer the site, track user’s movement around the site, and gather demographic information. IP addresses and other such information are not linked to any information that is personally identifiable. If you use this site, you are responsible for maintaining the confidentiality of your account and password and for restricting access to your computer, and you agree to accept responsibility for all activities that occur under your account or password. If you are under 18, you may use our website only with involvement of a parent or guardian. ORINOCO COFFEE & TEA, LTD and its associates reserve the right to refuse service, terminate accounts, remove or edit content, or cancel orders in their sole discretion. You may not use a false e-mail address, impersonate any person or entity, or otherwise mislead as to the origin of a card or other content. 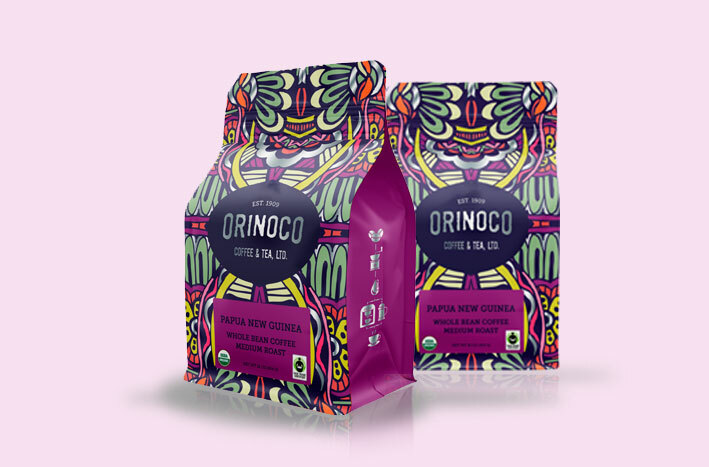 ORINOCO COFFEE & TEA, LTD reserves the right (but not the obligation) to remove or edit such content, but does not regularly review posted content. If you do post content or submit material, and unless we indicate otherwise, you grant ORINOCO COFFEE & TEA, LTD and its associates a nonexclusive, royalty-free, perpetual, irrevocable, and fully sublicensable right to use, reproduce, modify, adapt, publish, translate, create derivative works from, distribute, and display such content throughout the world in any media. You grant ORINOCO COFFEE & TEA, LTD and its associates and sublicensees the right to use the name that you submit in connection with such content, if they choose. You represent and warrant that you own or otherwise control all of the rights to the content that you post: that the content is accurate: that use of the content you supply does not violate this policy and will not cause injury to any person or entity: and that you will indemnify ORINOCO COFFEE & TEA, LTD or its associates for all claims resulting from content you supply. ORINOCO COFFEE & TEA, LTD has the right but not the obligation to monitor and edit or remove any activity or content. ORINOCO COFFEE & TEA, LTD takes no responsibility and assumes no liability for any content posted by you or any third party. When you visit the ORINOCO COFFEE & TEA, LTD’s website or send e-mails to us, you are communicating with us electronically. You consent to receive communications from us electronically. We will communicate with you by e-mail or by posting notices on this site. You agree that all agreements, notices, disclosures and other communications that we provide to you electronically satisfy any legal requirement that such communications be in writing.